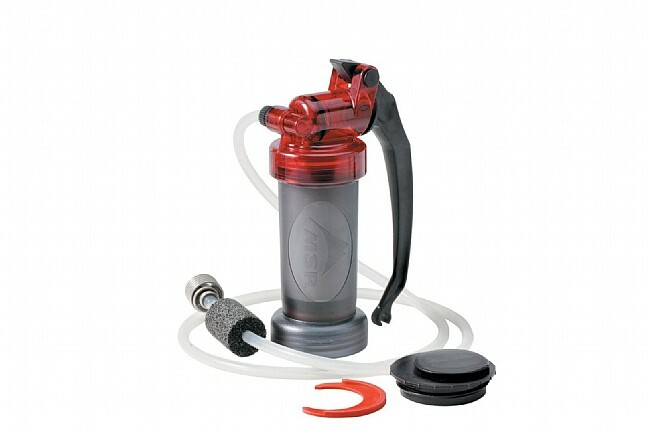 The MSR MiniWorks EX Microfilter delivers long-lasting, field-maintainable water filtration in demanding environments. Engineered for frequent and heavy use, it utilizes MSR's workhorse Marathon™ EX carbon/ceramic element to ensure clean, reliable and taste-free water. Thanks to its innovative AirSpring Accumulator™, it’s capable of pumping one liter per minute and the flow rate can be renewed easily and repeatedly in the field – no tools required. It’s lightweight and compact and, most importantly, been proven reliable by thousands of adventures through rough, challenging terrain. Pumps 1 liter of filtered water per minute with the AirSpring Accumulator™. Marathon™ EX carbon/ceramic element ensures safe, taste-free water – even with frequent use. Meets NSF protocol P231 for 99.9% removal of bacterial and protozoa in worst-case water.